My beautiful little girl Leila turns two today. I’m sorry I don’t have a ‘normal’ post lined up for today but I spent all weekend going OTT organising her birthday party and I’m pooped! I’m also sorry for another Leila post but if this blog stays in the internet ether for however many years, I’d love her to be able to look back one day and know that despite all the makeup related chatter, she was always my number one girl. I spent 10 minutes yesterday evening telling Leila all about when she was born. I told her how the first thing she did when she emerged was look for something, anything to stick in her gob. Just like her Mum. I told her how we spent the first 3 months of her life trying and failing to smooth the frown from her temples and I told her how I wanted to spend the rest of my life whispering “I Love You” into her ear until I knew for certain that she’d never, ever forget. Leila, I don’t half love you stinky bum. Happy birthday big girl! DAMN you for making me all teary-eyed first thing on a Monday! Happy birthday to your very beautiful girl. How did that go so fast? She is so so so beautiful! Happy birthday Leila! She is too cute! Happy Birthday Leila! She’s so beautiful. Happy Birthday Leila! Charlotte you have a beautiful daughter and I love reading your post’s about her! How exciting! I know it’s cliche, but isn’t it amazing how quickly it all goes? Have a wonderful day- both of you! such a beautiful girl, happy birthday Leila! Ahhhhh she is just perfection, absolute perfection. Reading this post has started my Monday off fantastically! 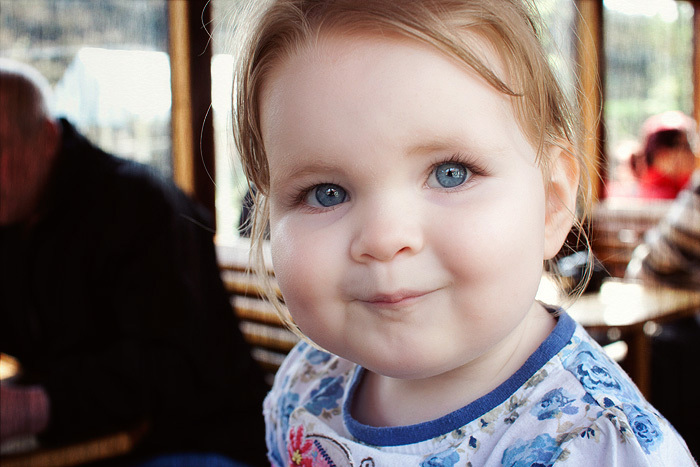 Ahhhh so lovely to hear another make-up mad mummy posting pure love for their wee one! She’s GAW-gus!! My little boy is 2 on WEdnesday and like you, I spend every minute I can telling him I love him…what you said really struck a chord, I never want him to doubt it or forget it…I want it to ring in his ears when he’s going to sleep or not with me for whatever reason….I feel like I’m going to burst with it sometimes! Made me more scared, more brave, more happy, more confused than I could have imagined! I believe children are the punctuation in our lives….they’re the exclamation marks, the full stops, the commas and dot dot dots…and very often the question marks!!! She’s so beautiful and sweet! Happy birthday Leila! HPB to the little cutie-pop! awwwwww she’s adorable. happy birthday to her! Aw, you are such a wonderful mommy. Your post made me tear up a little and I don’t even have any kids! I hope you guys have a wonderful day! You could sneak a pic of her into every post! Aww what a beautiful little girl you have – her eyes and smile are so radiant. I’m also filling up reading your gorgeous heartfelt post and feel exactly the same about my little ones (3&6). She is adorable! Happy birthday! She is an angel! Happy Birthday! Leila Bear! You have no idea what Auntie Candy has in store for you in August. BRING ON BAD HABITS! Charlotte, don’t you dare apologize for another Leila post… she is gorgeous! I love reading about her milestones and your experiences as a mother, plus your photography is always so wonderful. happy birthday leila! she is gog, i love her cute little chubby cheeks. Aww, happy belated birthday to Leila! She’s gorgeous and looks just like you! Happy belated birthday baby! Happy Burfday you gorgeous lil’ thing! I hope you had a wonderful day! I could seriously munch those cheeks. Major squish! I know I’m a bit late and all but she is GORGEOUS. I remember being younger and getting annoyed when all the old Indian aunties would pinch my cheeks and I’d think “why the hell are they doing that? Don’t they know that it hurts? !” but after seeing this pic of Leila, I totally see why it’s so tempting. I hope she had a fantastic day and that mum (aka you, as if you didn’t know :P) wasn’t too stressed out. I won’t say the same for Mr L because I know men never get stressed when it comes to birthdays..or much else (the lucky sods).